What is the best way to anchor walls to a concrete pad? 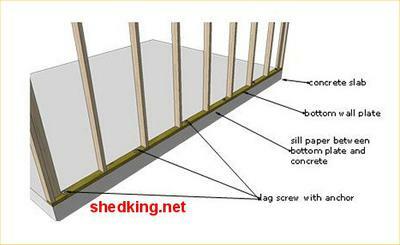 The best way to anchor walls to a concrete pad, if the pad already exists, is by using lag screws and anchors. The anchor locations are marked by first determining where they need to be on the bottom wall plate. Once you have these spots marked on the plate, holes can be drilled in the plate for later placement of the lag screws. Obviously you will only want your holes to be located where you are not going to be nailing wall studs. Place the bottom plate on the pad where it needs to go, mark the locations on the pad, then move the plate aside. Drill the appropriate holes in the pads for the anchors, then place the anchors in the pad holes. Next you build your wall, place 'sill paper' between the wall and pad, and screw down the lag screws through the holes in plate down into the anchors. Typically you have to have an anchor within 8" of every corner and at least every 3' to 4' in between your corners. As for the size of the lag screw, normally they are 1/2" diameter and 7 to 8" long. and after the concrete has set up, you place your bottom plate next to the bolts, mark locations for the holes to be drilled, then you can just set your wall down on top of these j-bolts, add washer and nuts. Hope this answers your question Danny.